Cranberry sauce is one of those things most people buy in jars, ready-made to serve alongside the turkey. But it's actually very easy to make and a very useful sauce to have around the house. I find the store bought versions rather bland. Full of sugar and cranberries, of course, but without the least hint of spice or mystery. Home-made sauce on the other hand, can be what you want it to be. I like hints of orange and cinnamon in it, maybe a pinch of allspice and - most importantly - a generous quantity of port. The sauce you then get is wonderful with the Christmas turkey, but it also scales new heights when it turns up on Boxing Day alongside the glazed ham! Like many home-made condiments this sauce is all about experimentation. So start with the recipe below and see what you like ... it's still an easy sauce to produce! You can use either fresh or frozen cranberries. Add less sugar than you think you'll need. You can always add more later. You can cook the cranberries in water or orange juice. The latter gives a fruitier sauce. The most basic recipe for cranberry sauce calls for nothing more than cranberries, water and sugar in a ratio of 2:2:1. So for 250g of cranberries use 250ml of water and 125g of sugar. Pop them all into a pan, cover and bring slowly to the boil. Simmer gently, stirring every so often, until the cranberries burst - this can take from 10-15 minutes. Leave to cool ... and that's it for the most simple of sauces. But, of course, you don't need to stick with just the basics. Dissolve 125g of sugar in 200ml of orange juice. Add a cinnamon stick and one anise star and bring to the boil. Add 250g cranberries and cook gently until they're pulped and most of the liquid is gone. Stir in 125ml port (any kind you have to hand) and warm through. Add orange zest, the juice of one lemon and a slug of brandy to your cranberries and cook the whole mix in orange juice instead of water. This makes a lovely fruity, zesty sauce. 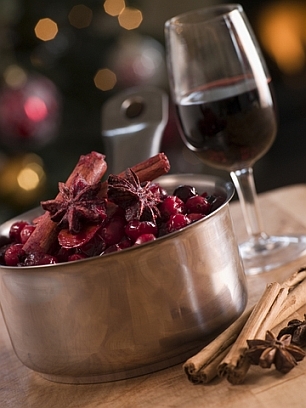 Cook your cranberries in red wine instead of water. You may need to add a little more sugar at the end. Alternatively, use half water half red wine. Add a few flakes of chilli to your sauce for a bit of a kick. Instead of adding port to your sauce, try Creme de Cassis. Finally, something I found online. It's perfect for those of us who love to experiment: Pear and Honey Cranberry Sauce. For more Christmas food return to the recipes page.